One day we will dance (and run) in celebration. Until then we will dance for a cure. You can contribute to PSU Club XC’s fight against pediatric cancer HERE. The Penn State IFC/Panhellenic Dance Marathon is the largest student-run philanthropy in the world, with all proceeds benefiting Four Diamonds at the Penn State Hershey Medical Center. Each year, it culminates in a 46-hour, no-sitting, no-sleeping dance marathon at the Bryce Jordan Center. 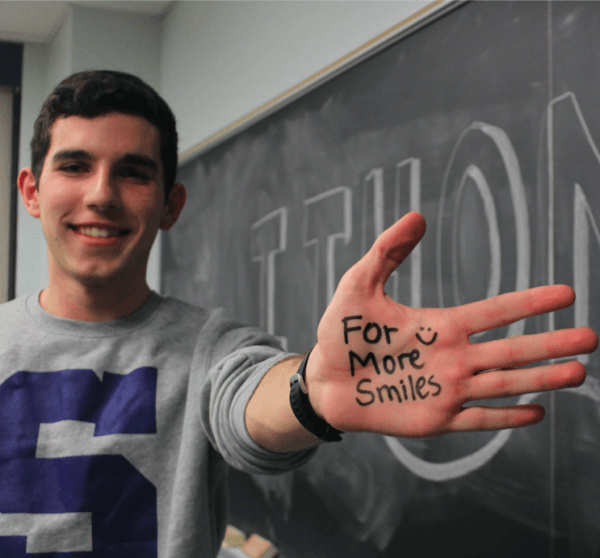 Since 1977, THON has raised over $147 million for Four Diamonds, engaging over 16,500 student volunteers annually. Check out the video below showing Club XC at THON 2019. What is Club XC’s involvement in THON? 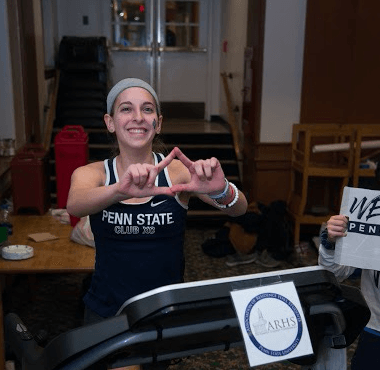 Club Cross Country participates in THON as a general organization, raising money through various fundraisers and operating on our own behalf, with proceeds contributing to THON’s annual total each year. Some of the fundraisers we hold annually include canvassing, THONvelopes, and the Donut Dash 5K. Our most successful fundraiser for the past few years has been Miles for Smiles, a 46-hour treadmill relay. Club XC is proud to be paired with four awesome families through the Adopt-a-Family program: the Justin Kaufman, Bryce Carter, Gideon Fisher, Corban Potter families! For THON 2019, Club XC contributed $67,401.09. For all members of Club XC, come join our Club XC Benefiting THON page!!! Got any suggestions for our THON Involvement such as new fundraisers, ways to connect with the families, or other comments? Submit them in our Suggestion Box! Below are our 2018-2019 THON Chairs. Feel free to reach out to any or all of them for any questions regarding THON or a Club XC fundraiser. Nathan is a sophomore majoring in Mechanical Engineering. He grew up running in town just outside of Pittsburgh and still hasn’t stopped. Nathan decided to come to Penn State to get involved in THON while also continuing to run with a super cool club team. He is extremely excited to help lead this team’s THON efforts this year and hopes to make it the best year yet! In his spare time he loves to nike, rock climb, and camp with teammates. Lauren is a sophomore studying Criminology and Psychology and is from Downingtown, PA. Being part of such a great team since freshman year, Lauren has found an amazing group of people as well as a new love for running. 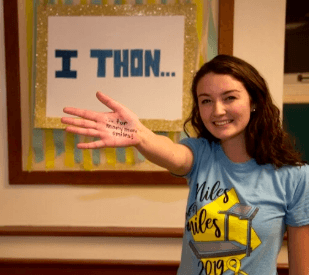 She is excited to see what 2020 brings to the team’s THON efforts and cannot wait to see the endless love the team will show for all our families. Outside of running, Lauren loves to listen to music, spend time in the great outdoors, and dance to tiktok songs. Beth is a freshman studying Biochemistry and Molecular Biology. Her first week at Penn State she joined Club XC and it is one of the best decisions she has ever made! Beth loves her Club XC family and their huge heart for THON, and this year she can’t wait to dance, hug, smile and work hard toward another amazing year! When she isn’t running, Beth likes to eat lots of West Hall cookies, dance with her friends, and cuddle her dog. Dom is a sophomore majoring in Immunology and Infectious Disease with a Studio Art minor. Dom started running with Club XC his first day of freshman year, and the team quickly became his Penn State family. 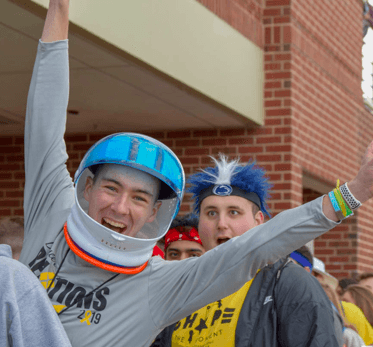 His favorite part of the team is its inclusiveness, passion, and constant positivity, and he hopes to be able to continue to spread these values as THON chair. Outside of running, Dom enjoys drawing and painting, editing videos, and distracting his friends in the library.